Paranormal Friends invite you to join them on another investigation of the former RAF Sleap Airfield near Shrewsbury, SY4 3HE. The airfield, which is pronounced Slape, was the scene of several fatal war time incidents. It can be found in the North Shropshire plain about three miles south-west of the town of Wem. The location is a favourite of the Paranormal Friends team and many guests have returned several times since our first ever investigation here back in September 2016. Investigators will have access to the control tower, including the briefing room, the booking out room, observation room as well as the period buildings which house the Wartime Aircraft Recovery Group Museum in which many artefacts are housed – including those recovered from fatal incidents. On our previous investigations, we have experienced a host of possible paranormal activity. In the engine room of the museum, we have had multiple K2 meters responding to questions at the same time, as well as lots of unexplained noises, incarnate voices, bangs and taps. Perhaps most dramatically, in another of the museum rooms, four people experienced the sensation of their chairs being moved by an unknown entity. This led to one guest being tipped out of his chair. 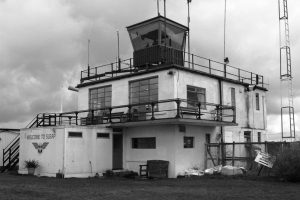 Designed to be a satellite station for nearby Tilstock airfield, RAF Sleap opened in early 1943 under 93 Group Bomber Command, and housed an OUT- Operational Training Unit. Armstrong Whitworth Whitleys – twin engined light/medium bombers were the mainstay of Sleap’s aircraft at first, and these slow but steady machines were a very familiar sight in the Shropshire skies. Two tragedies came to the airfield in quick succession in the late summer of 1943. Within a few weeks of each other, two Whitleys swung off the runway and hit the control tower, with fatal consequences for a number of the crew and some of those on duty in the tower. On a happier note, the airfield also provided a safe haven for lost/diverted aircraft on a number of occasions. After the war the RAF retained the airfield under ‘care and maintenance’. It came back to life in the 1950’s as a satellite to nearby RAF Shawbury and was used for the training of RAF air traffic controllers – Vampires and other early jets being among the main visitors. The use of the airfield by The Shropshire Aero Club started in 1955 when the group was first formed by local enthusiasts. Today the Club boasts a 500 strong membership making Sleap, Shropshire’s only licensed civilian airfield, home to over 100 aircraft. The Wartime Aircraft Recovery Group operates a museum on the site, in period, former RAF buildings. This all-volunteer group investigates crash sites and recovers and displays artefacts as a memorial to pilots that gave their lives operating in the Shropshire area during World War II. The displays include a number of aero engines, and a reconstruction of an airfield Flight Office. The airfield has also been used as a television set on a number of occasions. The aim is to use a combination of spiritual and scientific methods of investigation and you are free to choose whether you take part in any, or all, as you wish. These usually include; Victorian style Séances, Table tipping experiments, Glass divination, K2 Meters, Spirit/Ghost/Frank’s box, Rem-it lab (the UK version of the rempod), Laser grid lights, sound enhancers, pendulum, human pendulum, divining rods, trigger objects, digital voice recorder, photography and of course, your own senses, the original investigation equipment! Where appropriate and possible we also aim to experiment with the Singapore theory too. Please feel free to bring your own investigation equipment if you wish. All participants should wear adequate warm clothing, stout footwear and provide their own torch. Hot drinks and biscuits will be provided on the night. Please ensure that you have read and fully understand our booking terms and conditions, before purchasing tickets. They can be found by clicking this link. Book and pay with Paypal, debit or credit card. If you haven’t already done so, please join our Facebook group. Click here. Please click the 'Checkout' link below to complete your purchase. When you add tickets to your cart the details will update. Please click the checkout link below to complete your purchase.